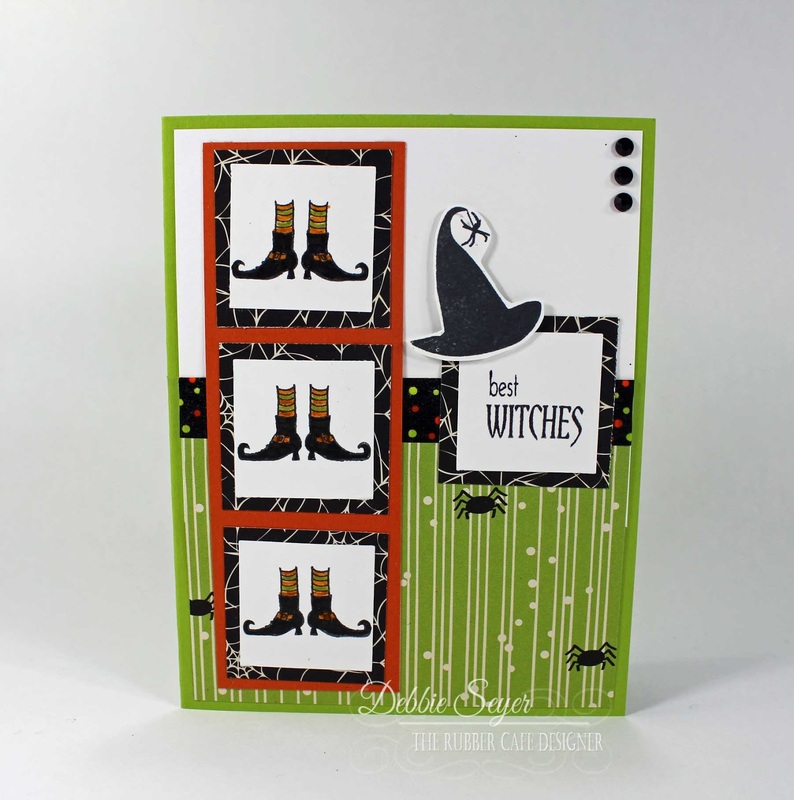 The Rubber Cafe Design Team Blog: Creative Cafe' Kit of the Month - Best Witches! Creative Cafe' Kit of the Month - Best Witches! Hope you are enjoying all the wonderful cards the design team has been showing you using the September Creative Cafe' kit. When I sat down to start creating projects using this kit, one thing kept coming up in my mind. What kind of tools do most cardmakers own? My conclusion was that most card makers own some type of square/circle punch or dies. So when creating all of my cards, I used only Squares or Circles - dies & punches - hoping that this would help you to use what you already have when creating cards with your kit. Here is my card for today! As you can see I used square punches on this card. 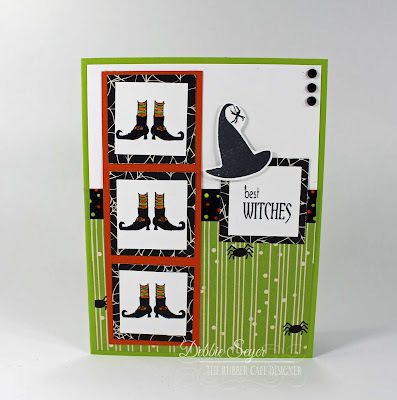 To start, I stamped the witches feet onto the white cardstock included in the kit using Tuxedo Black Memento Ink pad. I punched them out using my hand-held square punch and matted them onto a slightly larger square of patterned paper. Then I layered those squares onto a strip of orange cardstock. I did the same for the sentiment but didn't use any orange cardstock for that one! I colored the witches feet, and joined the white cardstock and patterned paper together using the washi tape (included in the kit). As an added little something I stamped the hat onto white cardstock and fussy cut it out and adding it to the sentiment panel. I applied black pearls to the corner to complete my card! Hope you get some ideas from my card that its easy to use the supplies and tools you already have at home to make projects using our Creative Cafe' kit! Great pictures of the process! tFS! Super cute! I'm with Kristine...great pictorial!